The 200-05106 Wind Monitor MA is an accurate and reliable wind sensor specifically designed for the rigors of the marine environment. All materials are carefully selected for corrosion resistance and maximum durability. The 200-05106 Wind Monitor MA is an accurate and reliable wind sensor specifically designed for the rigors of the marine environment. The wind speed sensor is a four-blade helicoid propeller. Unique transducer produces a pulse signal without electrical contacts or slip rings. 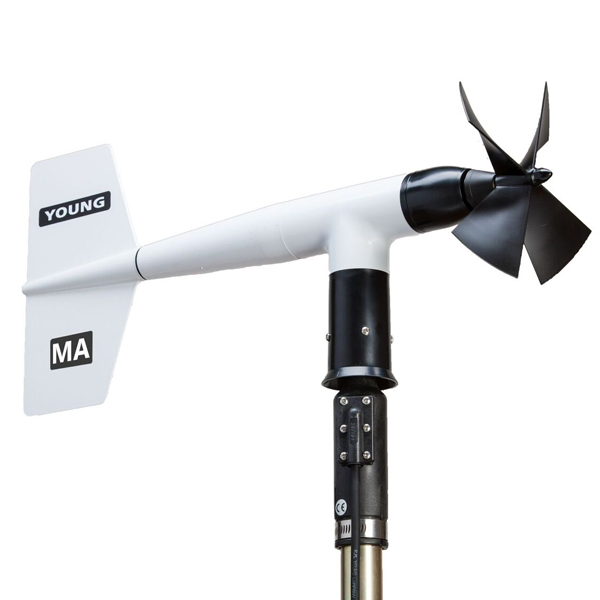 The wind direction sensor is a durable molded vane. Vane angle is sensed by a precision potentiometer housed in a sealed chamber. With a known voltage applied to the potentiometer, the output voltage is directly proportional to vane angle. All materials are carefully selected for corrosion resistance and maximum durability in the harsh marine environment. Extremely durable oversized ceramic bearings are used throughout. In addition to being more wear resistant, ceramic bearings are more corrosion resistant in environments that are hostile to steel bearings. The instrument mounts on standard 1-inch pipe. For specific applications, separate signal conditioning devices are available. Model 05603C Wind Sensor Interface offers calibrated 0-5 Vdc outputs for wind speed and wind direction. Model 05631C Wind Line Driver provides calibrated 4-20 mA current signals for each channel, useful in high noise areas or for long cables of up to several kilometers. Each interface circuit is supplied in a weatherproof junction box with mounting hardware for installation near the sensor.